Apps and mobile devices are endemic to our society but few library personnel have the expertise to make them. So many libraries either do without or use expensive outsourcing. However, there are new tools that allow someone with minimal training to create an app. The Google-MIT collaboration, App Inventor, is free and open-source. 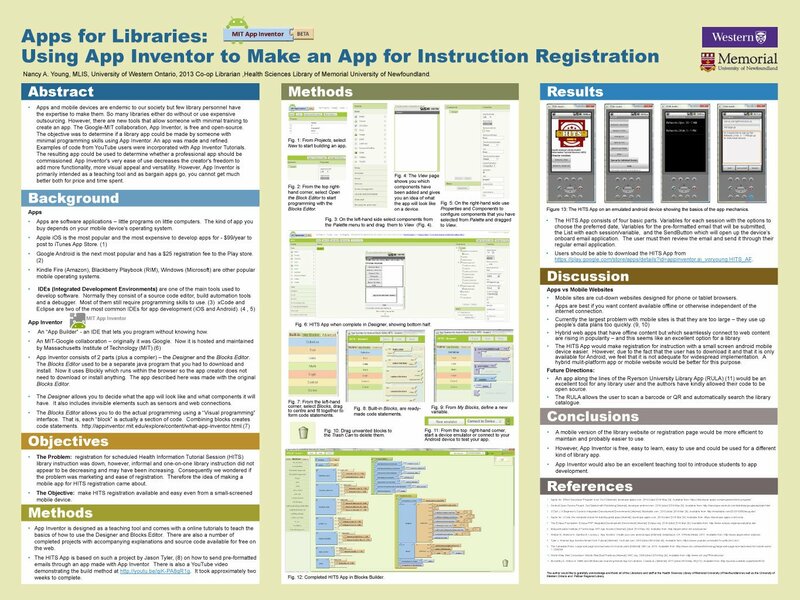 The objective was to determine if a library app could be made by someone with minimal programming skills using App Inventor. An app was made and refined. Examples of code from YouTube users were incorporated with App Inventor Tutorials. The resulting app could be used to determine whether a professional app should be commissioned. App Inventor’s very ease of use decreases the creator’s freedom to add more functionality, more visual appeal and versatility. However, App Inventor is primarily intended as a teaching tool as a bargain apps go, you cannot get much better both for price and time spent.